Confession: This headline is a bald-faced lie. You will never find your dream editor. Nor should you find your dream editor. Why? Because your career as a working, professional artist should not depend on a single editor at all. * Before you waste money on postage, investigate each publishing house's preferred subject and themes. Learn which editors deal with which topics, and direct your work to them specifically. * Editors are people, and people are unique. Each one will work differently and see different things in your work. Subjective? Absolutely. But that's not necessarily a negative. It means at least one person exists in the great wide publishing world who will recognize your ability, connect with your story, and help you further along the path. * So an editor wants to work with you. Now what? Give editors 10x more than they ask for. This will build their trust in your ability to receive feedback, revise, and improve your material. * Be communicative. Respond promptly, revise thoroughly, ask questions, and push back when necessary. * And just when you think you're ridin' high on the Publish-Me Express ... your editor changes houses. Don't panic. See how it all shakes out. You stand a great chance of expanding your network (provided they're staying in the industry). As one editor pointed out, "We leave projects, not relationships." So if they have more authority at their new digs or develop more contacts, your work might find an even better home. * Also, don't discount the associate/assistant editors who rise in their place. These folks will be hungry for books and eager to make their own mark at work. Your material might be just the ticket. * They ask questions. Good questions. Lots of them. * They have access to lots of money to give books their best production and promotion. * They have great relationships with the art director. * They themselves have a discerning and trained eye for art & design. * They are bulldogs, committed to making your work all it can be. P.S. You're not off the hook, writers. The editor's job is to be the first reader. And while they're not expecting perfect manuscripts, it's your responsibility to submit the strongest manuscript possible. Plus, you must remain an active and involved partner in the process. Editors can't drag you to glory, even if they wanted to. 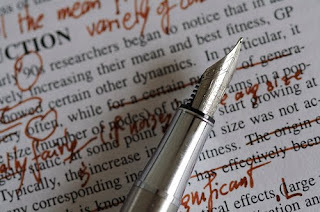 So we now know there are no perfect editors -- just as there are no perfect writers. But damned good ones live in both camps, so let's do our best to get together and make our work sing.